2017 Organic Food Delivery from New Terra Farm! So why are we growing, hoeing, haying (and groaning)? Because we wanted good food that was also good for us! And we can bring the same farm fresh goodies that we eat to your door. "Clean, fresh, and delivered - you can't get better than that"! "We loved the snow peas and summer squash"! "Wow! So much better than non-organic"! "Excellent quality, keep up the good work. Friends were very impressed with the concept and the quality of food, as are we". We believe natural foods taste better, as well as being better for you. Its guilt-free extravagance! 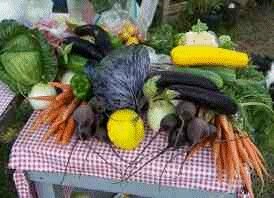 We don't worry so much about diets and just focus on growing (or buying) and eating naturally good foods, in as fresh a state as possible. 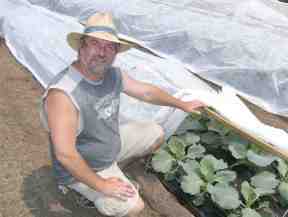 We grow all our veggies without chemical herbicides or pesticides. And, all our animals are raised on pasture, no cages or confinement. 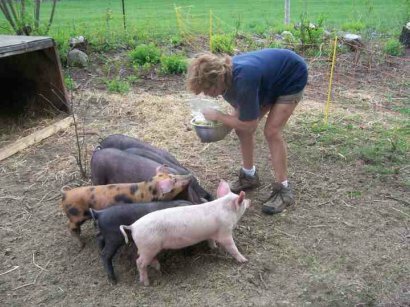 Our animals get only certified organic grain that we buy from a local farmer. Nothing but the best for our piggies, chickens, lambs and cows! You could say that we actually grow (wait for it . . . . ) green eggs and ham! The subscription food delivery program out of the Food Hub provides farm fresh produce and other local goodies for a (limited) number of member families. 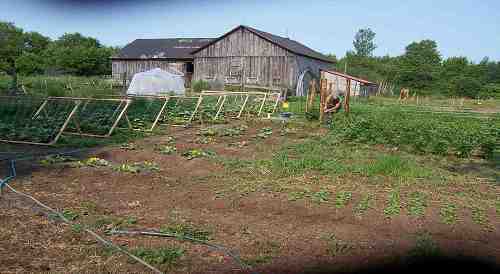 This type of farming is called Community Supported Agriculture (CSA). Our food delivery CSA members’ support helps cover the start-up costs of our farm operation. In return, they receive shares in the farm's bounty through our organic food delivery service, as well as satisfaction gained from reconnecting to the land and participating directly in food production. When you order from us, you are eating the same food we do. This is your assurance of freshness and quality. Quantities will vary, some crops will thrive, some may be less successful. REMEMBER: MOTHER NATURE BATS LAST! Stay tuned for more details about the Food Hub program, coming soon! Or use the contact form below to get on the list. New Terra Farm also has other farm goodies available throughout the year. Ask about our free-range pasture-raised New Terra Farm Choice pork, chicken, and beef. Our meats are inspected, quick-frozen, and made up into box orders, sized to fit in your refrigerator freezer. A variety of order sizes are available, please use this form to contact us for more information. You can get more information about any of our products by using the contact form below. New Terra Farm wins Innovation Award! Our organic food delivery CSA customers know we use both new-fangled technology (computers, spreadsheets, e-mail, web pages) and low-input farming methods (companion planting, row covers, raised beds, drip irrigation) on our farm. We wrote up our unique marketing and management model, and the judges in their wisdom decided we were winners!